New Joint Initiative from the Knight and Sogin Labs as a Follow-up to the MoBEDAC Initiative – microBEnet: the microbiology of the Built Environment network. If you’ve been reading our posts, you are quite familiar with our efforts at characterizing the bacterial and fungal communities of the built environment. We’ve described our study design, experimental protocols, and results. One thing we may have left you wondering about, however, is the nuts and bolts behind the analyses we and other MoBe researchers are doing. 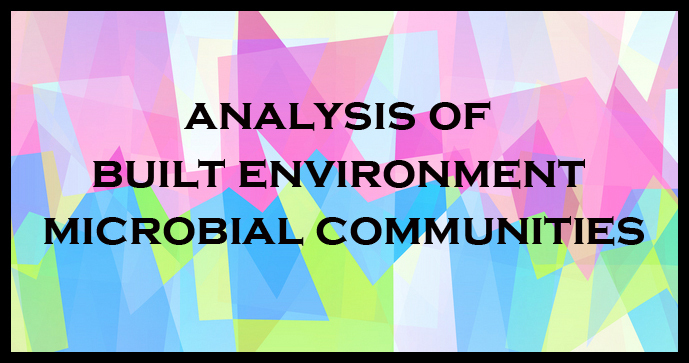 The analysis of built environment microbial communities is not as straightforward as it may seem at first glance. The way nearly every step of a project is carried out-from sample collection to the specific tools utilized in analysis-can affect the final results, and studies using different protocols and tools may not be able to be directly compared to one another. The MoBe community has a real need for standardized, streamlined, user-friendly tools that will enable the production of high quality data that can be accurately compared across studies. Enter a new collaborative effort between Drs. Mitchell Sogin and Rob Knight, the goal of which is, quite simply, to standardize built environment marker gene study protocols so that MoBe researchers can focus on the good stuff-the primary research questions. This effort is a follow-up to the MoBEDAC (Microbiology of the Built Environment Data Analysis Center) initiative, which supported improved metadata curation resources, analysis workshops, and integration of specific analysis tools (MG-RAST, QIIME, and VAMPS). MoBEDAC taught us that these tools need to be improved to fully standardize and streamline built environment microbial community analyses, and therefore, the current grant proposal was born. By the end of the funded period, standard 16S rRNA and ITS (fungal) analysis pipelines will be developed and made available to the MoBe community, 16S rRNA and ITS databases will be markedly improved, QIIME and VAMPS will be tightly integrated into a new database engine called QiiTA to facilitate analysis by all MoBe researchers, and two major training workshops will be offered. This new initiative should streamline and standardize MoBe project design and analysis, facilitating a unified MoBe research community that is sure to discover countless more exciting things about the microbiology of the built environment. Comments and input are welcome!